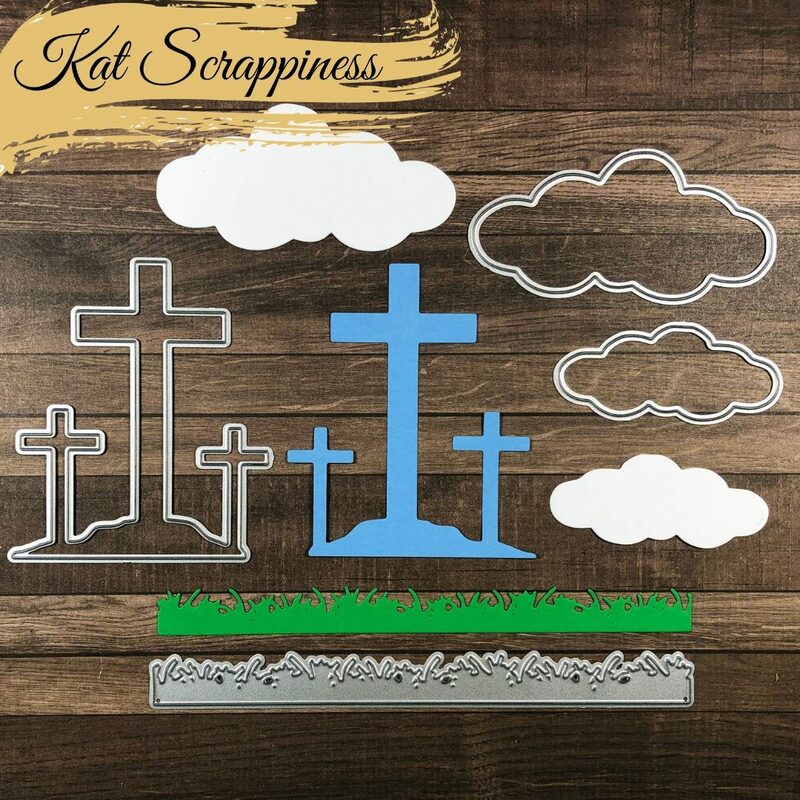 Hello Kat Scrappiness fans! It is the second day of the March Release. We will also be giving away the die set that is being revealed each day during release week and a SPECIAL GIFT to whoever places an order until March 22nd, using the supplies link below. PLEASE SCROLL THROUGH AT THE END OF THE POST TO FIND OUT HOW TO WIN. I finally received the dies today and I couldn’t wait to play with the He Is Risen die set. Just to let you know, the other design team members are not able to participate in this release today because of their religious belief. Caren Used a Sunburst Stencil to ink up her background with some distress oxide inks. She die-cut the grass from some patterned paper and adhered the same, with some liquid adhesive. 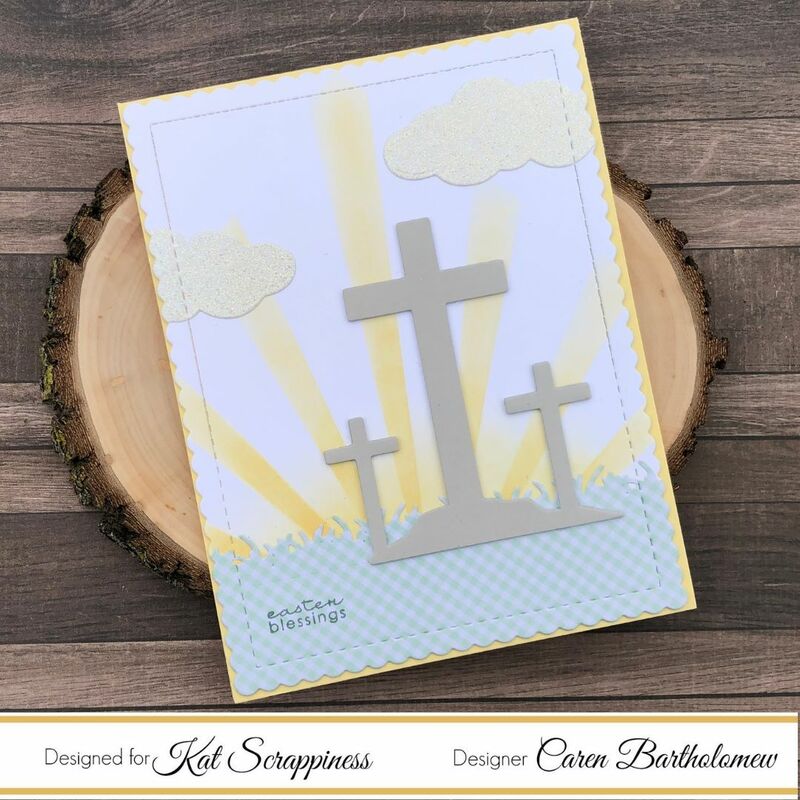 She die-cut the clouds with some glittered card stock and the crosses using some light gray card stock. She adhered the die-cuts on her card and added “Easter Blessings” as her sentiment. Our guest designer this month is Lindsay Adreon and she created this beautiful card with the dies. She inked up her background with some distress inks and added the white clouds. She die-cut the crosses and also added the grass that are all inked up with distress inks. Lindsay also used the zigzag dies and finished her design by adding some sparkling clear jewels and stamped the word “Blessings” as her sentiment. She will have a video showing how she made her cards. For Lindsay’s second card, she colored her watercolor card stock with some Arteza brush pens and created this gorgeous background. She die-cut an oval vellum using the oval zig zag die and also die-cut the crosses with some black card stock. So pretty! Can you say less is more? I absolutely ADORE this card by Lisa. She die-cut the crosses on some kraft card stock and layered a ribbon on it. The gorgeous white background with some teal patterned paper made this card super classy. Another beautiful card by Lisa. 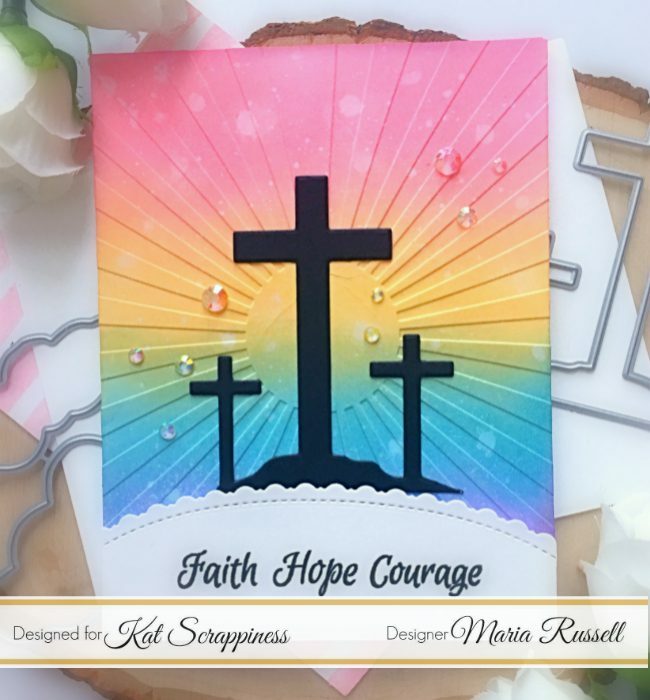 She used the zigzag rectangle die and used the crosses from the He is Risen die set to die-cut the middle and adhered this piece on some script patterned paper. Priscilla created this wonderful background using different distress oxide inks. Isn’t it beautiful? She will have her own blog post and/or video showing you how she made this card. 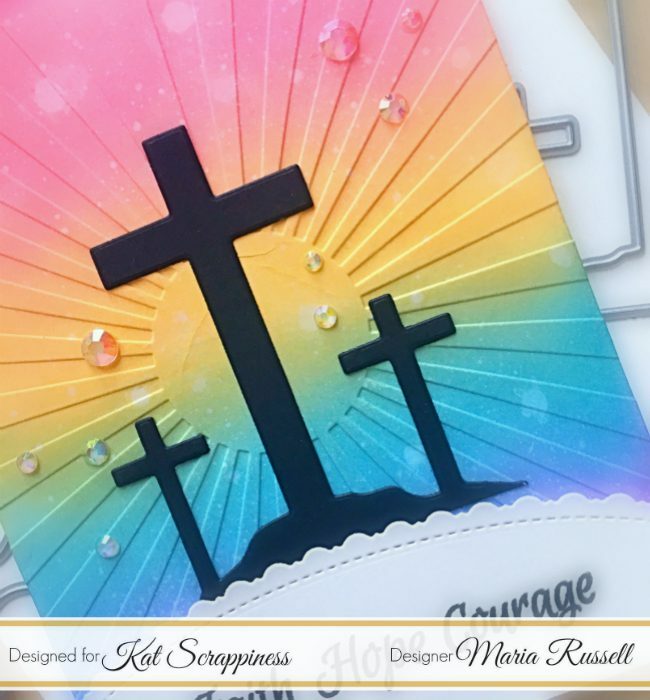 She die-cut the crosses from the He is Risen die set with some black card stock and adhered the same on her colored background. 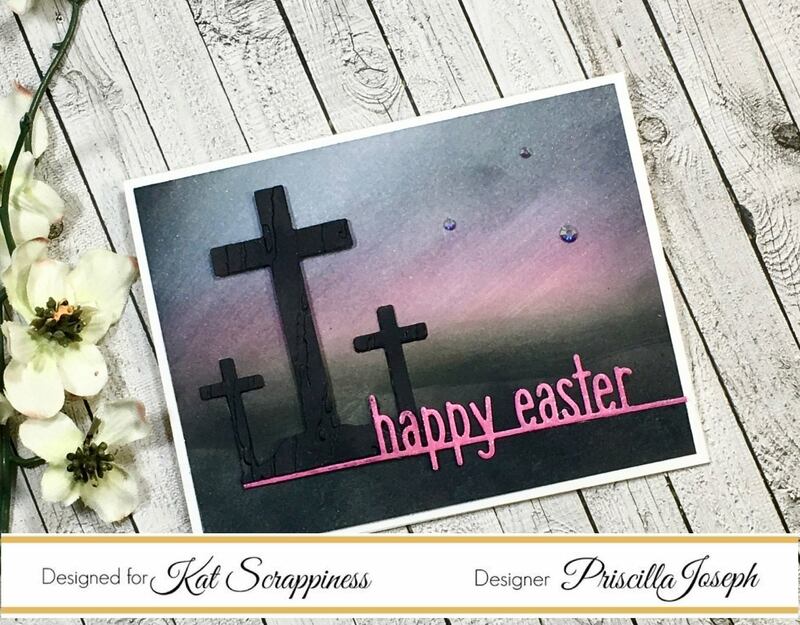 She added the Happy Easter line border by Lawn Fawn as her sentiment and finished her design by adding some sparkling clear jewels. It is amazing to see the various moods captured in these cards using the same dies. Some remind us of the darkness and Christ’s pain, while others glory in his resurrection. Fab work from the designers. Love all of these wonderful Easter cards. I will be using these ideas for our church card ministry–thanks so much! THESE are GORGEOUS!!! I love love love the cloud die! I love this die set!! I love that this products conveys the true meaning of Easter! Beautiful inspiration by the design team. Beautiful dies. Cross dies are hard to find! Love all the samples! Beautiful set!!! Perfect for Easter and other religious holidays!! !